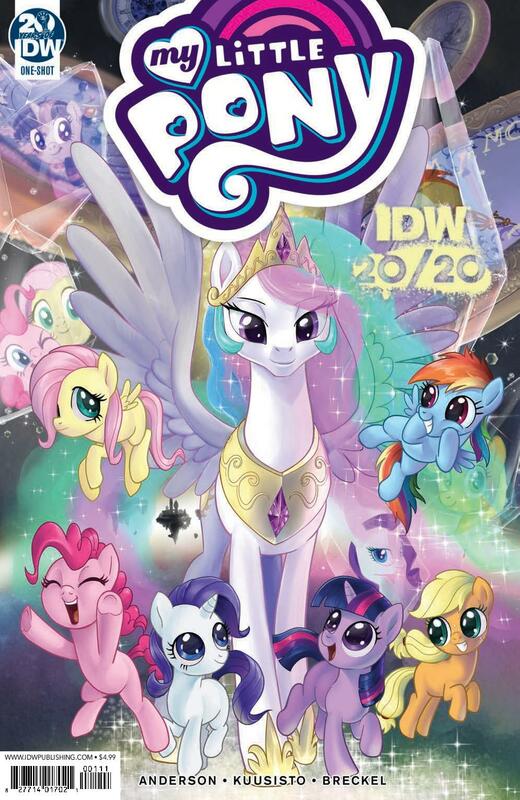 IDW Publishing continue their 20th Anniversary celebrations with My Little Pony 20/20. It’s a giddy, brightly coloured Quantum Leap with hooves. Oh boy! 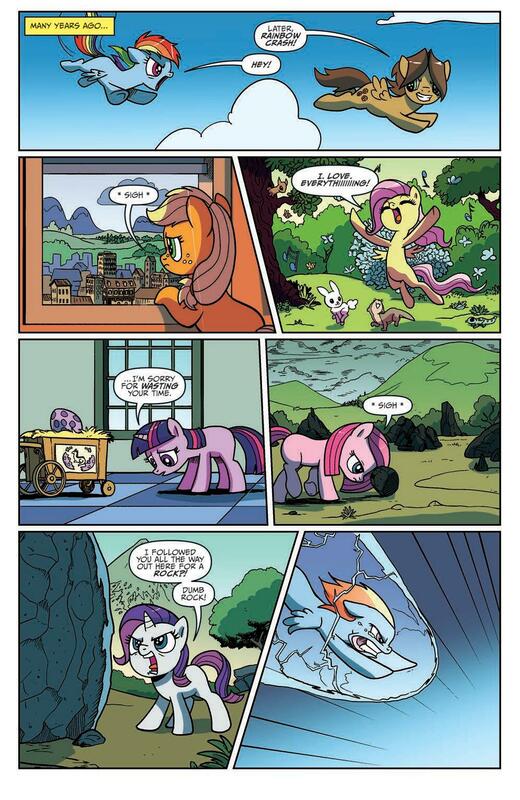 This has to be one of the strangest comics I’ve read in quite some time. It’s frantic, it makes little to no sense, and seems to move at an alarming pace whilst nothing much is actually happening. It’s sort of like having a conversation with a tweenager whose grasp of humour and reality is a tad questionable. 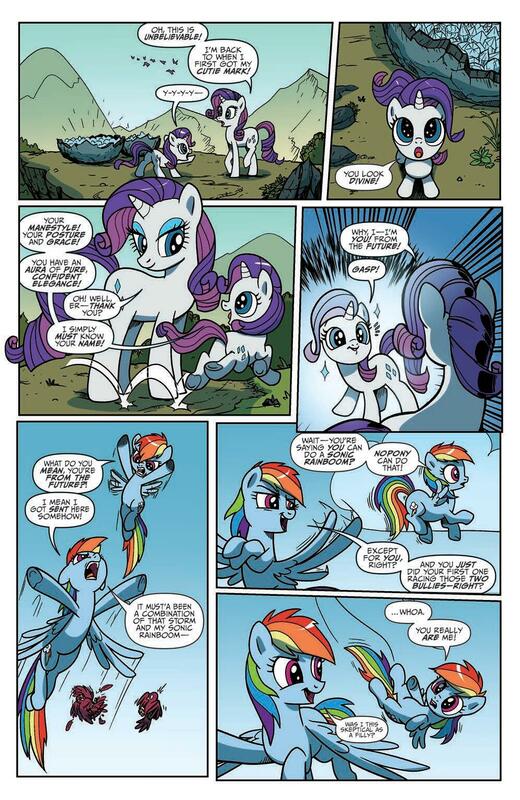 Full disclosure: I am not a fan of My little Pony. In fact, I’m not clued up on the modern cartoons or comics at all. For me, My Little Pony was a toy line from my youth aimed mostly at girls, except my youngest brother had one. Oh, and there was something called smooze? Anyway, we begin this time travelling equestrian extravaganza with a scene of fancy flying gone awry. 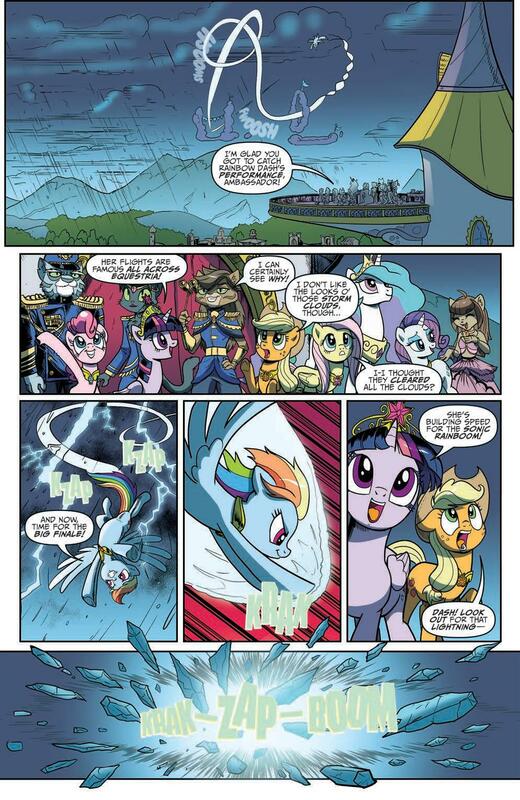 Rainbow Dash is showing off some killer moves, in the middle of a storm no less, when all of a sudden she finds herself face to face with her younger self. As do her friends. It just… happens. It has to be said there’s some fairly chunky dialogue dealing with quantum realities that would make any Star Trek-loving parent proud should their child recite it, while the majority of the story is told in a very snappy, choppy manner with odd emphasis here and there. Frankly it’s written like the transcript of a playground conversation – weird attitude and overly emotional absurdities in abundance. While this clearly isn’t aimed at me, I love the fact that I can recognise the language of a younger generation written with such a degree of respect. What does bug me is the lack of meaning behind the story. The 20/20 concept IDW has adopted has so far been used to show glimpses into the past and possible futures of their franchises in a more or less ambiguous morality tale type fashion. 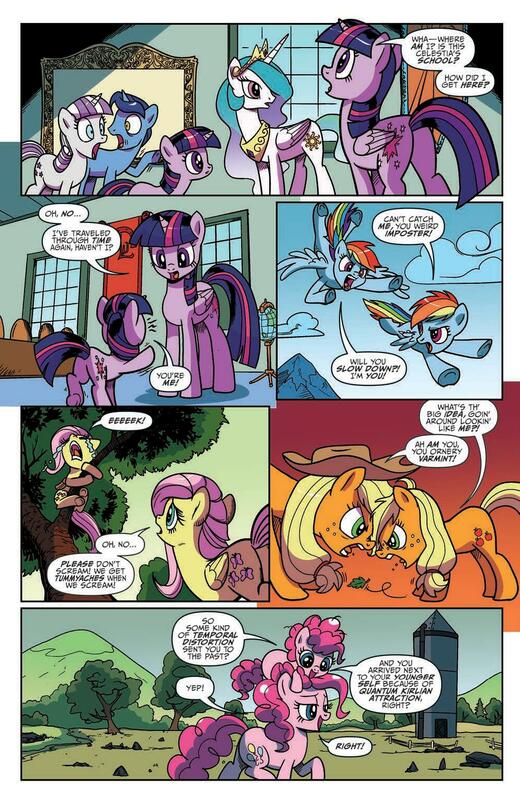 This isn’t quite the case here which is a real shame, because a My Little Pony comic, presumably aimed at a younger readership, is where stories about looking back or forward and contemplating growing up would absolutely shine. Instead, in the denouement we get a frustrating comment from the culprit behind the timey-wimey stuff asking what we’ve learned on our journey. Huh? What journey? At the end of the day, it’s a spectacularly colourful headscratcher, and the sort of thing my daughter would delight in explaining to me.